Gao Yutao is an artist. Spanning a web of myths and microcosms, Gao Yutao’s first solo-exhibition at Migrant Bird Space Berlin revolves around the theme of “stone”: the stone as a prominent subject in Western & East-Asian mythologies, as a medium of spirituality and as an object of artistic merit in and of itself. 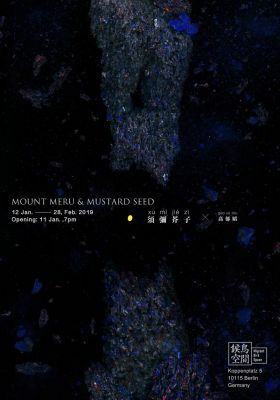 The title of the exhibition, “Mount Meru & Mustard Seed”, goes back to Buddhist cosmology where the sacred Mount Meru is considered to be the center of all physical and spiritual universes. As the metaphor goes, fitting the entire five-peaked Meru into a tiny mustard seed means recogni-sing the potential of even the smallest things in life: both are subjects of thought and as such, they occupy the exact same space in the mind. In the first part of the exhibition, Gao Yutao uses scanned imagery of stone-structures and postcards from artworks on East-Asian & Greek mythology to create surreal large-scale prints which explore the interconnections of micro- and macro-worlds. The second part of the exhibition features installations with sculpture and projection, fathoming the relationship humans have had with stones as a practical material and as subjects of spiritual significance. Gao Yutao, born in 1988, is a conceptual artist from Hunan, China. Since 2014 he has lived and worked in Germany, and studied under the famous sculptor Katharina Fritsch of the Düsseldorf Academy of Fine Arts. In the division of the two-dimensional and the three-dimensional space, where the time flows, I believe, there must be an indescribable new world. It likes the a adjacent land is cut off by a deep river. You see both side of banks clearly. But the only deep river, who supplies the nutrition to both banks, stimulates your curiosity to explore it. The name „Architectonics 2.0“ is borrowed from the Internet, such as Web 2.0, which emphasizes interaction between person to person. Architecture 2.0 emphasizes more than just 3D intervening into the 2D. I hope that in the future, the small glass in this work will be magnified by 3D scanning and made by a transparent material. I can place it into the real space, to complete a invasion of 2D to 3D. The performance “Returning Home” is a work based on the legend of the “Women Stone” in the Aaper Forest, Duesseldorf. Yutao traces the legend by trailing a stone back to its source, the Rhine River, 10 km away from the Women Stone. The artist combined a collection of real hominid stone axes with the iconic white packaging from Apple. It expresses a relationship between ancient and modern tolls. Interestingly, he had found an evidential text in <A History of the World in 100 objects> to support the relationship between stone axes and language, which further deepens the artist’s close connection between iphone boxes and stone axes. They will be put in the green wood boxes for military use at the exhibition, let the audience ponder over the different meanings the stone carries in the long history. For Gao Yutao, one of the responsibilities of art is to blur the inherent definition of today, whether it is an object or event.